Lush synths are sprinkled over contemporary and traditional ceremonial instrumentation to create a hyper realistic world. 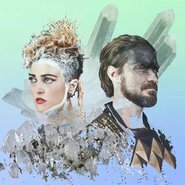 Ginger and the ghost have built a grassroots following in Europe with their unique musical vision drawing on luminaries such as Björk, Fever ray and Bat for lashes. Performing at festivals such as SXSW, Big sound, Meadows in the mountains, B-sides and Milhoes da festa to name a few. Their upcoming album New rituals devours the duo’s past sound, evolving into a majestic landscape of pop.